This past month the Boy Scouts of America held their annual Boy Scouts of America’s American Values Luncheon. Keynote speaker for the luncheon was none other than Shaun Alexander, the former University of Alabama and Seattle Seahawks running back. Alexander focused on his four keys to success put God first, set high goals, work hard, and enjoy the moment. Shaun Alexander is a Florence, Kentucky native played high school football for Boone County High School and finished with numbers that are still top ten in prep high school history such as over 6,000 rushing yards and 110 touchdowns in only three seasons none the less. Alexander would sign a scholarship to play for college football powerhouse Alabama Crimson Tide in 1997 and would stay there until 2000 after setting 15 school records. In the 2000 NFL Draft, the Seattle Seahawks made Alexander the 19th overall pick in the first round and after his first season really settled into the feature back spot as he rushed for over 1,300 yards and 14 touchdowns behind only Hall of Famer Marshall Faulk. The following three years, Alexander stayed atop the rushing leaderboards but in 2005 he broke out in what would be one of the best seasons for not only Alexander but running backs in general. He compiled a then record 28 touchdowns, over 1,800 rushing yards and an MVP award on route to leading the Seahawks to the Super Bowl. After a few more seasons in Seattle and a final season with the Washington Redskins Alexander retired from professional football and is still today the Seahawks all-time leader in rushing yards, rushing touchdowns, and rushing attempts. Alexander is living today on a farm and raising his eight beautiful children and also has written a book titles Touchdown Alexander. 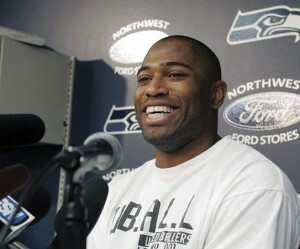 This past month, Shaun Alexander gave a keynote speech at the Boy Scouts of America’s Annual Values Luncheon. Alexander’s speech was focused mainly on his four keys to success and his life after football. The event had a great turnout and gave attendees a chance to hear from an NFL great about life and how he and subsequently they could reach their own greatness. If your company is interested in finding out availability and booking fees for a former NFL rushing leader such as Shaun Alexander or other sports celebrities for a Keynote Speech, Fundraiser Event, Guest Appearance, or Football Camp, call us at 1-888-246-7141.